Jimmy Wheeler wants to be a normal 16 year old boy and fit in at school, with girls, to just have a normal life. But, he's superhero with a lame superpower--he can stick to things. The problem is, he can't control when it happens or get himself unstuck without help. After a fiasco in the grocery store with the supervillain, Vinyl Man, Esmeralda Flinch, CEO of the Women's Trade Federation, manipulates Jimmy into joining her in a mission. He is to attend an elite boarding school as Jerry Faulkner and assist Esmeralda in kidnapping the 16 year old daughter of the despotic president of Burgerslovegia. Eventually kidnapped, himself, he spends a summer of body building and training in martial arts, Jimmy gets the confidence and the skills he has always wanted but is obligated to Esmeralda to carry out the assignment. Does he have the heart to be a supervillian? 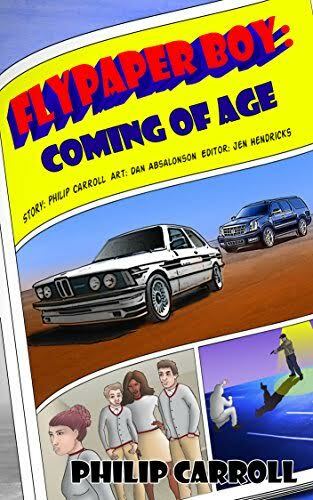 Flypaper Boy: Coming of Age is a lighthearted adventure with equal helpings of teenage conflict, friendship, and first kisses. Join Jimmy Wheeler, The Flypaper Boy, as he learns there is more to his power than just sticking to things, and more to responsibility than just doing what others expect of you.